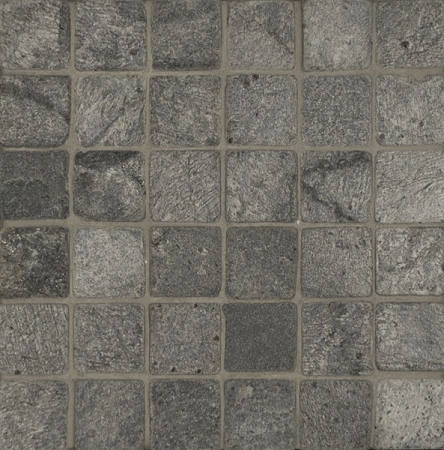 Platinum Slate 2x2 Mosaic Mesh Tumbled is a mosaic made from small, rectangular slate tiles. 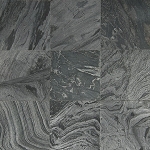 The color of the tiles is dark grey with silver swirls. The stone tiles have been tumbled to a slightly rough texture with the clefting still very evident. The uneven surface reflects some light but is not shiny. The tiles are arranged in a brick pattern with grey grout in between. Platinum Slate 2x2 Mosaic Mesh Tumbled is made from high-quality slate. The uneven feel of the mosaic’s surface is a great way of adding texture to any space. It is ideal for use in wet areas because it is non-slip. The material is strong and could stand use in high traffic places. The color is dark, perfect in hiding stains or dirt. Platinum Slate 2x2 Mosaic Mesh Tumbled is best used outdoors for any application in the driveway or gardens. It can be used on stairways or as cladding for stone fences. Product arrived earlier than expected and in great condition. Color and style was exactly as show online. Saved a tremendous amount of money over local distributor prices. Customer service was excellent - they called a day after I placed my order and said they were sorry, but it was out of stock and on backorder. They asked if I'd like to cancel my order or wait...I said I'd wait, and they said they'd see what they could do to get my product from another location. Lo and behold, my order arrived the same week! Just thrilled all around.